ABOVE: View of the Conowingo Dam on the Susquehanna River in the aftermath of Tropical Storm Lee taken Sept. 12, 2011. Photo by Wendy McPherson, U.S. Geological Survey. A new report from the Maryland Public Policy Institute warns that Maryland’s $14.4 billion plan to clean up the Chesapeake Bay will not satisfy an EPA mandate—because the plan ignores the Conowingo Dam as the single largest source of sediment and nutrient pollution in the Bay. The report laments that the lion’s share of the $14.4 billion burden, $13.5 billion, is disproportionately targeted to mitigate nitrogen pollution from sewage plants, stormwater, and septic systems, which only account for 7% of all the pollution into the Bay–and will only reduce nitrogen by a negligible 2% by 2025. The mandate was established in 2010 to meet Clean Water Act standards by 2025. “The EPA, Maryland Department of the Environment and the Chesapeake Bay Foundation got together and decided we needed to get rid of nitrogen, that nitrogen was the villain,” said James Simpson, who presented “A Better Way To Restore the Chesapeake Bay” at a forum at Washington College Tuesday. The event was sponsored by the Maryland Public Policy Institute and the Thomas Jefferson Institute for Public Policy, free-market think tanks. Simpson admits he’s not an expert in the science of the cleanup plan and bases his argument solely on the science Maryland officials have relied on to meet the EPA mandate. His experience as an economist and budget analyst for the White House Office of Management and Budget drives his argument that most of the $14.4 billion has been steered to the least effective strategies. He worked at the White House office during the administrations of Presidents Ronald Reagan and George H.W. Bush. Simpson’s report claims dredging the sediment trapped behind the Conowingo is a more cost-effective method to reduce pollutants in the Bay. MDE Communications Director Jay Apperson said Summers cancelled his appearance for “personal reasons.” Christopher Summers, president of the Maryland Public Policy Institute, said the department could not offer a replacement for Summers. The plan estimates a cost of $3.7 billion, or $3,217 per pound, to reduce nitrogen from septic systems–and yields only a 0.3% reduction of nitrogen through 2025. Mitigating nitrogen loads from stormwater runoff and sewage plants will cost $3,442 and $620 per pound respectively—contributing just 1.7% in nitrogen reduction. The total amount of nitrogen reduction in Maryland through 2025 comes to 5,389 tons, just 359 tons annually, yet the annual nitrogen discharge from the Susquehanna through the dam is 71,000 tons–if no storm events occur. “[Conowingo] provides more [nitrogen] in a year than we’re going to focus $14.4 billion on from now until 2025 to get rid of,” Simpson said. He said Tropical Storm Lee in 2011 alone dumped 42,000 tons of nitrogen into the Bay. Simpson said the states in the Bay watershed will collectively spend $40 billion to reduce a total 34,000 tons by 2025, which is less than half the amount that flows through the Conowingo annually. “So I would ask the Maryland Department of the Environment, the governor and a lot of the legislators why they’re willing to spend $40 billion, and in our case $14.4 billion, for an effort that will accomplish zero,” Simpson said. The discharges from Conowingo have increased as the dam has gradually lost its ability to trap sediment and nutrients since its construction in 1928. Currently there is an estimated 174 million tons of sediment behind the dam with 3 million more added each year, which Simpson says has been largely ignored in the EPA mandate. 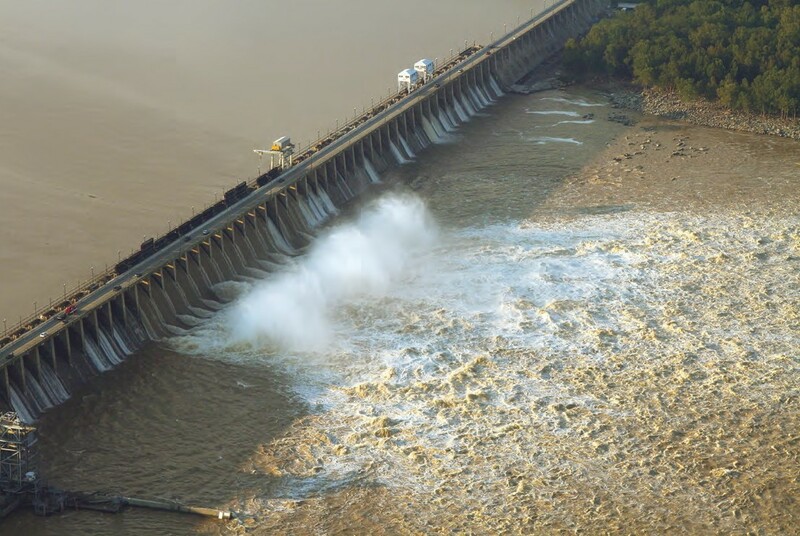 Conowingo hemorrhaged 19 million tons of sediment during Tropical Storm Lee in 2011 and amounted to 40% of the total discharge from 2002 to 2011, according to a report from the U.S. Geological Survey in 2012 on Lee that Simpson cites in his report. The report warned that sediment discharges could increase by 250% once the dam loses the ability to trap sediment. Robert M. Hirsch, the author of the report on Lee, told Maryland Reporter that the 2010 EPA mandate overestimated the remaining storage capacity of the dam. “The [2010 mandate went] on the assumption that Conowingo had a considerable ability to trap sediment and phosphorus, so they’re going to have to be redone at some point,” Hirsch said. Simpson said the devastation to the oyster population in the northern part of the Bay is largely attributed to millions of tons of sediment from the Conowingo from regular discharge and storm events since the 1970s. “The sediment covers the whole upper bay in inches and prevents oysters from reproducing,” he said, and pointed to a chart that showed a massive decline in the oyster harvest in the upper Bay since Hurricane Agnes in 1972. He said with each major event that oyster population never rebounds and sinks further into decline. Simpson’s report claims the cost of dredging the dam would run $48 million a year to remove two million tons of nutrient laden sediment and the additional disposal costs could be defrayed by using the sediment to produce “lightweight aggregate,” a commonly used building material. Dredging could also eliminate or reduce the $43 million Maryland Port Administration spends each year to dredge the shipping channels. “Even at twice the cost, dredging the Conowingo would be a bargain in nutrient and sediment removal, given the $14.4 billion the state intends to spend to remove only 3.4% of the Bay’s nitrogen,” the report said. Hirsch said vacant quarries near the dam could be safely used to dispose of the sediment. Here’s a 17-minute video of Simpson’s presentation. Simpson’s report was challenged from the audience by Chester Riverkeeper Isabel Junkin who said the $14.4 billion was aimed at cleaning local waterways where local problems exist. “When we talk about spending that money it’s to impact our local rivers and streams,” she said. She said the sediment plumes from storm events are not impacting local streams or rivers. “The water quality in our local rivers is actually being impacted by our local problems,” she said. Simpson pointed out that the EPA mandate can be challenged by states and counties. The 2010 EPA mandate was the result of a lawsuit won by Chesapeake Bay Foundation that legally bound the EPA to enforce the 1972 Clean Water Act. Under a consent decree, states in the Chesapeake Watershed, from New York to Virginia, were required to adopt Water Implementation Plans that reduced the Total Maximum Daily Load of sediment, nitrogen and phosphorus into the Bay. Maryland drafted its plan by requiring local governments to enact local WIPs–on the idea that runoff into the Bay from local streams and tributaries should be the responsibility of local governments to mitigate through regulations and taxing authority.